When Tom acquires large libraries (as in 75,000 books large), we often find sprinkled within them old rare book catalogs. 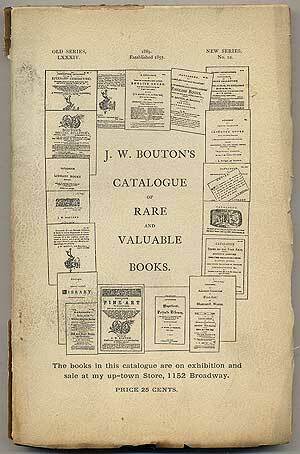 The other day we came across one that was particularly noteworthy, an elaborate and illustrated 1889 rare book catalog from the 19th Century New York bookseller J.W. Bouton. He had been issuing catalogs for 30 years at that point, and this appears to be both a 32nd anniversary catalog, and an excuse to re-list a lot of good stock that had not yet sold over the previous several years (what bookseller can’t relate to that?). It is with a feeling of satisfaction, not unmixed with, I trust, pardonable pride, that I send forth the present catalogue — the eighty-fourth issued by me during a business career of over thirty years. The series commenced in 1857, a year of ill omen, amid the crash of banks and old-established firms, and while the country was in the throes of financial panic, and the first of the series bid fair to be the last; but, as a delicate child often outlives its more robust fellows, so this proved the forerunner of a long-lived race. Since then the series has gone steadily on, weathering many perilous storms, and undergoing one shipwreck which threatened to engulf it, but from which it emerged safe and sound, and is now as vigorous as ever, thanks to the exertions of many steadfast friends. The catalogue issued to-day speaks for itself. Never in the course of my business career have I got together a finer collection of valuable books. In the course of thirty years many changes have taken place in the book business. Many a book that at the outset of my career was a drug on the market I have lived to see become a great rarity; others, that were rare then, have become simply unattainable. On the other hand, some that were in high demand have since fallen into disgrace, and now stand unheeded and uncalled for on the bookseller’s shelves. Still, however Fashion may change, and this or that class of books come into or pass out of vogue, good sterling books of real merit will always be in demand, while the first editions of the works of great writers will continue to rise steadily in value, and will be prized as long as the English language is spoken, which, thanks to the many vigorous branches from the parent stem, promises to be long. Thirty years ago the old booksellers of New-York could be counted on your fingers; since then they have multiplied exceedingly. Bartlett & Welford, then under the Astor House — which was not so far downtown as it is now— both men unrivaled in their knowledge of books; the indefatigable Joseph Sabin; Wm. Gowans, familiarly known as Old Gowans, who will long be remembered for his eccentricities; Timothy Reeves; Calvin Blanchard, a disciple of Free Love and exponent of Positivism, also known as the publisher of the only complete translation of Rousseau’s Confessions and Voltaire’s Candide; John Doyle, who christened his establishment “The Moral Centre of the Intellectual World,” a most eccentric character, at whose store I used often to drop in while an errand boy in the employ of the old firm of Daniel Appleton & Co. (with whom my business life began at a salary of two dollars a week); and John Bradburn, were the shining lights of their day, and they have all passed from the scene of their activity, except the last, who still carries on his business; and with them have gone many of the old collectors of that time — William Menzies, James Lenox, George Brinley, Andrew Wight, John Allan, George T. Strong, Dr. David King, W.G. Medlicott, John A. Rice, Robert Lenox Kennedy, John Carter Brown, Samuel J. Tilden, and many others. Fortunately for the bookseller, as fast as one book-collector retires two new ones spring up in his place. 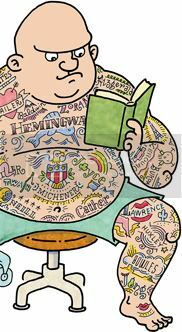 The complaint that old books are not so generally prized as formerly is ill founded, and what apparently justifies it arises from the fact that the book business, in common with nearly every other, has been overdone of late years. There are more collectors of rare books to-day in proportion to the population than ever before. In my annual trips to Europe, I have brought to this country many treasures in the book line, and on glancing over my old catalogues I experience a good deal of satisfaction at having been the means of introducing so many fine books to this side of the Atlantic —for they have come to stay. Year after year the competition for rare and standard books becomes more keen, and the older ones necessarily become more and more difficult to procure. In the English book-centres, besides a large home demand, the purchases for the United States and the English colonies keep up a steady stream outward, and first editions must sooner or later become unattainable, as they will ultimately find a resting-place in public institutions. Luckily for the collectors of the present day, this is still far off in the future. There is some analogy between the dealer in rare books and a jolly Boniface. In the course of his business the book-dealcr gets togethcr many treasures that he parts with with regret. So Boniface welcomes all comers with a smiling face, and meets many guests he is loath to see depart. But, as those that go are replaced by others, and he always finds pleasant company, so the dealer in books finds other treasures to take the place of those he sells. In looking over my old catalogues, I have thought it would be interesting to many of my old customers — and I am glad to say that there are yet many on my books who have been with me from the start — to reproduce the covers of some of my old catalogues in miniature on that of the present one. These relate the history of my business to some extent, and, incidentally, some of that of the country. No. 1 shows where I first started my business — at 87 Walker Street, a fine old dwelling-house, which when originally built was looked upon as uptown. Nos. 12, 20 and 29, successive removals uptownward. My first removal was to 481 Broadway, next door to Brougham’s Theatre, afterwards Wallack’s Theatre. My next move was to 416 Broome, in which house formerly lived Thomas Hamblin and Mrs. Shaw, lessees of the Bowery Theatre, the former a famous actor and fine tragedian and the latter equally well known to fame as an accomplished tragic actress. No. 80, the establishment of an uptown branch. No. 32 alludes to the abolition of the duty on books printed over twenty years, and No. 40 to the panic in 1873. In No. 1, I find some books which bring out in relief some of the changes which thirty years have effected in prices. For instance, there is a copy of the Abbotsford edition of Scott’s works, 17 vols., handsomely whole-bound, for $125.00. A similar set is in the present catalogue at $225.00 — and is cheap at this figure. The 1811 edition of Grammont is priced $9.00; in the present catalogue a copy of the same edition is put at $22.50. Singer’s Shakespeare is in at $20.00, which is worth to-day in similar condition about $50.00. Sir Thomas Browne’s works, Pickering’s edition, priced $12.00, to-day is worth twice that sum. The Pickering Chaucer in at $10.00, now brings three times the price. Major’s Walpole’s Anecdotes, priced $22.50, is in the present catalogue at $75.00. Rowlandson’s Dance of Death, at $6.50, and the Dance of Life, at $1.75, are in this catalogue at $75.00 for the three volumes, and are difficult to procure at this figure. Pierce Egan’s Boxiana, in calf, for $7.50, is in the present catalogue for $47.50. In No. 2, Purchas’s Pilgrims, fine copy, is in at $175.00. A similar copy would bring now $500.00. La Fontaine’s Fables, with Oudry’s plates, is priced $40.00. In the present catalogue a copy is priced $85.00. In No. 3, a fine copy of the Nuremberg Chronicle is priced $35.00. In this catalogue a copy is priced $150.00. On the other hand, a few have remained stationary or have depreciated. Bayle’s Dictionary, best English edition, in at $45.00, may now be had for $30.00. The Pinkerton’s Voyages, in at $47.50, may be had for about the same figure. Watt’s Bibliotheca Britannica, in at $50.00, may now be had for $30.00. The “Bridgewater Treatises,” 12 vols., 8vo, readily commanded $100.00 at one time, and now will hardly realize more than one-tenth of that sum; while Chalmers’s Biographical Dictionary in at $50.00, is now not worth more than $20.00, and many others might be mentioned which have depreciated in like manner. The reason for some of these changes is plain. The Chalmers and Watt’s have been, to a considerable extent, superseded by later works, and the Bayle is too cumbersome for modern usage. The Pinkerton, I believe, will be much higher, as it is unquestionably a collection of sterling value. In passing in review these old lots, many a familiar face springs up before me with all the vividness of yesterday, and the incidents of thirty years ago come back to me in a flood. But I have, I fear, already overstepped the limits imposed to this little retrospect. In conclusion, I wish to return thanks to my friends and customers for the patronage which has been the key-stone of my prosperity, and to remark that if the acquisition of my books affords them as much pleasure as the getting them together has given me, there will be reason for mutual congratulation. « More on Paperback Originals; or, Enough Already!